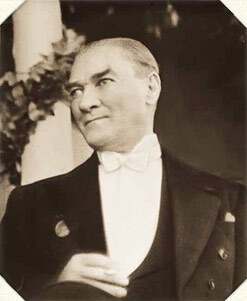 Mustafa Kemal visited Bursa in 1922 soon after Izmir’s liberation from Greeks. The reason for the lack of success of our society lies in the indifference towards our women. Man comes into the world to live as long as his destiny allows him. To live is to act. So, if an organ of a society acts while the other lies idle, then it means that society is paralyzed. A society must accept all the conditions and necessities on which its success in life depends. So, if science and technology are necessary for our society, our men and women must equally master them. As you know, division of labor is necessary in social life as it is in all the other fields. In general division of labor, women should not only carry out their duties, but they should also take part in efforts for the prosperity and welfare of the society. Oh hero Turkish women, you are worthy to rise to the skies on our shoulders. Today, the discipline to be taught by mothers to their children is not as simple as it used to be in the past. For today’s mothers, to bring up sons and daughters that have the necessary virtues as active members of today’s life, depends on having many high attributes in them as mothers. For that reason, our women must be more enlightened, more intellectual and more learned than men if they really want to be the mother of the nation. A society is comprised of two genders: male and female. Is it possible to lift a huge block up if you concentrate on one side of it and leave the other side completely unattended? Is it possible that a part of a society reach the skies while the other part is tied to the ground with chains? Actually, our women have always been side to side with our men in social life. Not only today, but for a long time past, our women have worked and struggled no less than men on the fronts, in farming, and in making a living. Maybe it was our men who fought against the enemy with their bayonets, But it was our women who kept the narrow resources available for the army composed of men. It always has been, and it still is our women who make it possible for our country to go on. No one can deny that it was always our women who made it possible for our nation to keep up its presence during this and previous wars. It has always been them, the divine women of Anatolia who not only plowed and sowed fields, gathered firewood from the woods and mountains, took the crop to the market and cashed it, provided bread and butter to their families, but also carried ammunition to the front in oxcarts or on their shoulders under severe conditions.